This piece original appeared in On Faith. Today, the Open Internet Order becomes effective. Adopted after a year of national debate, the order codifies “net neutrality” — the principle that keeps the Internet an open and democratic space. Specifically, it bans carriers like Comcast and Verizon from blocking and slowing down websites at will, or charging sites extra fees to reach people faster. Why are Americans of all faiths and beliefs celebrating? If carriers created “fast lanes” online, most faith and non-profit groups could not afford to be in them. Slower connection speed — even by 100 milliseconds — causes people to click away. Left behind in the slow lane, it would be much harder for people to reach their websites to connect, worship, innovate, and organize. Moreover, if carriers had the power to block websites with which they disagreed, some groups would not have a voice at all. For many in the faith and interfaith world, the Internet has become the prophetic platform of the twenty-first century. Yet even as the Open Internet Order becomes law today, major carriers are threatening to override it through action in Congress and the courts. 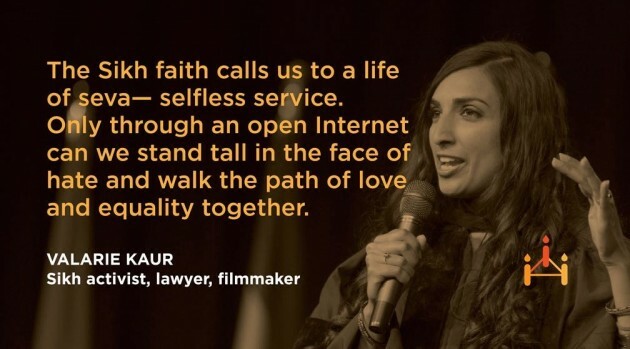 That’s why Faithful Internet is amplifying the voices of faith and justice leaders on the issue. Read on to hear from 12 of the nation’s top faith and moral leaders as they call on us to protect the open Internet for the future of religious and spiritual life and interfaith action in America. “Right now, the web is a place where all Americans have an equal voice, regardless of color, economic status, or beliefs, and we need to keep it that way. An open Internet is vital for our organizing efforts in social justice — here in North Carolina and around the country. “My Christian faith teaches that we are to go to the edges of our society and hear the stories of those who are left out of our economy and outside our care. Once we have heard the stories, we are required to share them far and wide. “Today’s young people are the Internet Generation. For more than a decade, I have served as a chaplain for nonreligious students and young people — the demographic that now makes up 35 percent of young adults in the U.S. I’ve seen how this generation uses the Internet as a necessary place, not just to connect but also to change the world for the better. “In the Humanist community, young people are using the Internet to raise millions of dollars for causes such as hurricane relief, micro-loans, and recovery from addiction. My own students and the local community have been able to package more than 120,000 healthy meals for food-insecure kids, because we could use the Internet to mobilize hundreds of volunteers and donors. Any party that threatens the open Internet jeopardizes our work — and risks losing an entire generation of supporters. An open Internet means survival for the LGBTQ community. For LGBTQ young people who are still routinely told they are an abomination, embarrassment, or blight on the family name, the Internet is the first place they go for community and survival strategies. For parents trying to make sense of what their LGBTQ child’s experience and their own reactions, the Internet is where they turn for advice. Surfing the Internet is the equivalent for this generation of smuggling Is the Homosexual My Neighbor off the library shelf and devouring its messages in the privacy of a bathroom stall. As such, the open Internet is the mother’s milk to the LGBTQ movement. And for all those struggling with feelings of shame and isolation because of their gender identity or sexual orientation, it is literally a lifeline. “As a faith-rooted organizer inspired by prophetic fire, I believe that community organizing is the pathway to achieve democracy. While face-to-face meetings are the heart and soul of traditional organizing, digital organizing is changing the face of political activism. In our Internet Age, it’s vital that we advocate for an open Internet so activists around the world can converge for love, justice, and peace. “When a gunman opened fire inside a Sikh gurdwara in Wisconsin in the largest attack on a faith community in recent U.S. history, national media trucks left too soon. But we kept the story alive — online. A new generation of Sikh Americans and allies used the Internet to connect, pray, and organize. Through blogs, videos, tweets, and online petitions, we responded to hate with love, optimism, and a call to action. “When Mike Brown was killed and left to wilt in the sun for hours, our multi-racial congregation gathered on our pulpit and prayed with our hands up. Then we organized on the open Internet. The online images of our beautiful congregation — so many lovely shades of human — doing acts of justice travelled the nation in news media like The Washington Post, The New York Times, and The Huffington Post. “In a time of great turmoil and suffering, the prophet Habakkuk cries out for a vision of hope from God. God tells Habakkuk: ‘Write the vision; make it plain on tablets, so that a runner may read it.’ The prophet is charged to bring a message of hope to the people in a way that is clear and accessible to all. “In my work as a faith-inspired author, advocate, and organizer, I see how important the Internet is for people of faith. From church websites to faith-based blogs, from theological education to online fellowship, from communicating with colleagues around the globe to organizing people for action across town, people of faith are using the Internet as creatively as they used print, radio, and TV in the past. “At Trinity United Church of Christ in Chicago, we use the Internet to bring people into the church and empower them to help solve our communities’ most pressing issues. Any threat to the freedom of using the open Internet to evangelize and organize for the sake of sustaining and improving people’s quality of life is an assault on our rights to life, liberty, and the pursuit of happiness. It would be like taking away a citizen’s right to vote. “A few months ago, I stood on a field with more than 5,000 Muslims and wept. It was a memorial for three Muslim students — Deah Barakat, Yusor Abu-Salha, and Razan Abu-Salha — who had been killed execution-style in their home in Chapel Hill by a neighbor who hated religion. As a rabbi in North Carolina, I felt it was my sacred duty to stand with the Muslim community. I also knew that many people felt the same way, but needed an outlet.